Today’s job seekers are more tech-savvy than ever before. This applies to virtually every candidate and role. Gone are days of walking in and applying in person – this approach has been replaced with the expectation of a personalized online experience that can be delivered entirely on mobile devices. As organizations look to leverage technology to help manage the candidate experience and the overall hiring process, it’s paramount that they understand that technology alone will never be enough. Technology is only part of the solution. Real success comes when organizations realize the importance of change management and challenging the way they have always done things. All too often organizations take the same old school behaviors they’ve relied on before technology was in place and then try to replicate them with technology. It’s time to eliminate or replace these practices. 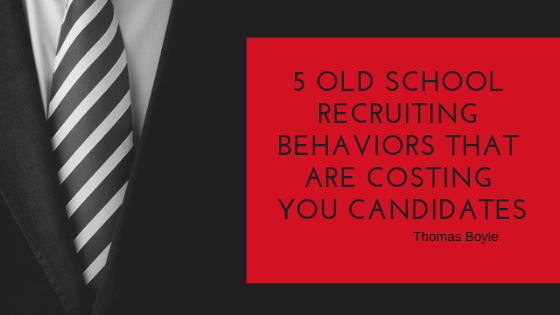 Having consulted with organizations across a wide range of industries and sizes, I have compiled a list of old school behaviors that impede the ability to attract and convert candidates in today’s market. So What’cha Want: When it comes to candidates, and more importantly career sites, one size doesn’t fit all. Today’s candidates expect targeted personalized content. It’s no longer enough to have a single career page in the hopes that visitors will find the right job, understand why they should work for you and ultimately apply. Organizations looking to stand out should create multiple branded career pages targeting the most important types of roles and audiences. Get It Together: In today’s technology driven world it has become increasingly common to hear about data breaches with some of the largest most recognizable organizations. As a result, candidates and consumers alike have become reluctant to supply personal information without a strong sense of purpose and security. All too often organizations are collecting personal information that puts both the organization and candidate at risk. Review the candidate journey to ensure that you’re collecting only what you need and when you need it. Poor Communication: Above everything else candidates are looking for transparency and the perception of fairness throughout the application process. One of the most common mistakes I see is waiting too long to disqualify applicants. If your average time to fill is 30 days and you have a shortlist of candidates being interviewed there is no need to wait to disqualify the other applicants until the end of the process. Be respectful of their time and communicate as much information as possible as often as you can. Hold It Now, Hit It: Change management is paramount when leveraging technology for your hiring process. Stop dipping your toes into automation. Simply automating your old paper process is not enough–don’t be afraid to double down on automation and leverage technology that makes your work more efficient. This is your time to challenge the status quo. Partner with your technology provider, review best practices and continuously review your hiring process and technology adoption. Sabotage: A majority of organizations leveraging technology have a one and done consideration and placement strategy. This means that candidates are considered solely for the position to which they apply. Once disqualified they are notified and the record sits in the Applicant Tracking System with no activity or consideration. Increase operational readiness and reduce your time to fill by leverage technology to tag high potential candidates and create shared talent pools. This article originally appeared on ReWork, an online magazine sponsored by Cornerstone OnDemand featuring news and ideas on the future of work. Visit ReWork at www.cornerstoneondemand.com/rework. In his current role, he provides advice to clients to help fully leverage and optimize the Cornerstone application and create business strategies to align with business goals and objectives. Before joining Cornerstone, Tom worked as a product executive, building cutting edge recruiting, onboarding and video interviewing technology for the large enterprise. He has consulted with hundreds of global organizations on their unique business challenges, helping to assemble the right recruiting and onboarding strategy to meet their needs.